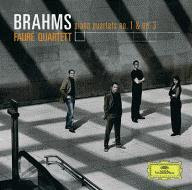 The Fauré Quartett continues to add authoritative recordings to the chamber music catalog with their new recording of two Brahms quartets, available from Deutsche Grammophon on January 12, 2010. These large, some say symphonic, works test the limits of technical and musical capabilities, and the Fauré Quartett once again proves why they are one of the most acclaimed ensembles performing today. Within a short period of time the Fauré Quartett has conquered the great concert halls of London , Paris , Berlin , Amsterdam , Brussels , Geneva , Hamburg , Frankfurt, Milan , Buenos Aires , Rio de Janeiro and elsewhere. “They attract superlatives wherever they go,” wrote The Strad following a concert at London ’s Wigmore Hall, while the Süddeutsche Zeitung praised them for a performance that “brought tremendous pleasure by highlighting interpretative details that had scarcely ever been heard before”. These works are typically “Brahmsian” and are reputed to be brittle and full of melancholy as well as indicative of Brahms’ obsession with the symphonic ideal and his ability and tendency to compose “symphonic” chamber music. Indeed, Arnold Schoenberg took it upon himself to fully orchestrate the first quartet “in order to hear everything for once.” By stepping back and truly examining what Brahms was feeling emotionally and trying to achieve technically, the Fauré Quartett is able to bring their fresh and revitalizing interpretation to audiences both live and on record.